acdc34434 had the most liked content! Completely unhinged eh? Belly popping out will always garner attention. Today is your lucky day, because you found this fat hug devouring 3 big hamburgers a big soda and a bid French fries at McDonald’s. Wearing a really small and tight shirt, showing her round belly and her muffin tops, she walks trough all the place, catching all the views of the people right there, on her enormous body. 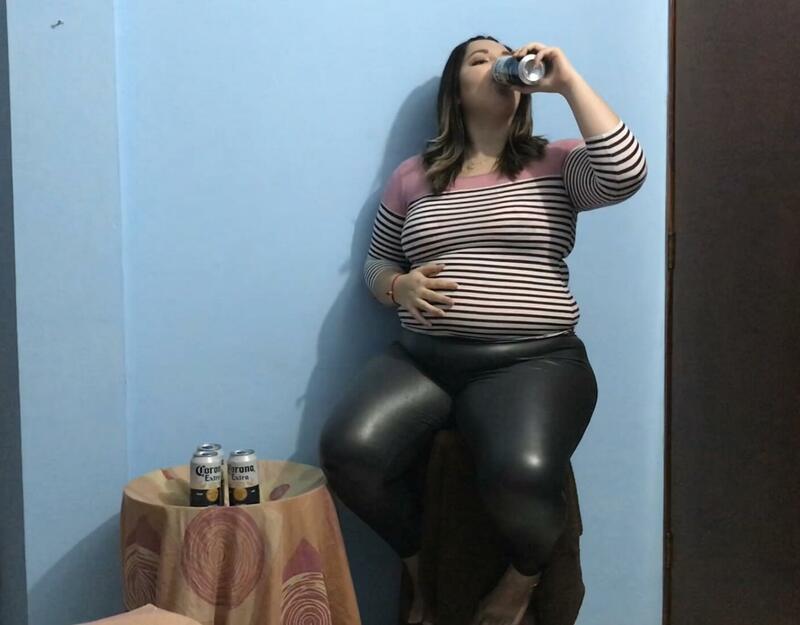 She takes a seat in the perfect place for you... now you are catching all her fat angles and now you have the best view to see how Laura is pigging this meal, who is definitely too much for a person. Bite by bite the pig goes finishing all that grease food. At this point, her belly is so big and rounder that the shirt she’s wearing is looking like a top... she looks completely stuffed but she is decided to finishing the 3 hamburgers so her best option is to unbutton her jeans to keep pigging. Hey, what about your week?? ?… mine was busy but fine, and actually this is how I started the day, you doesn’t have an idea of how I’m looking now!! Getting some serious size on now! A traditional burping video with a exceptional huge and hot Laura’s belly full of beers. 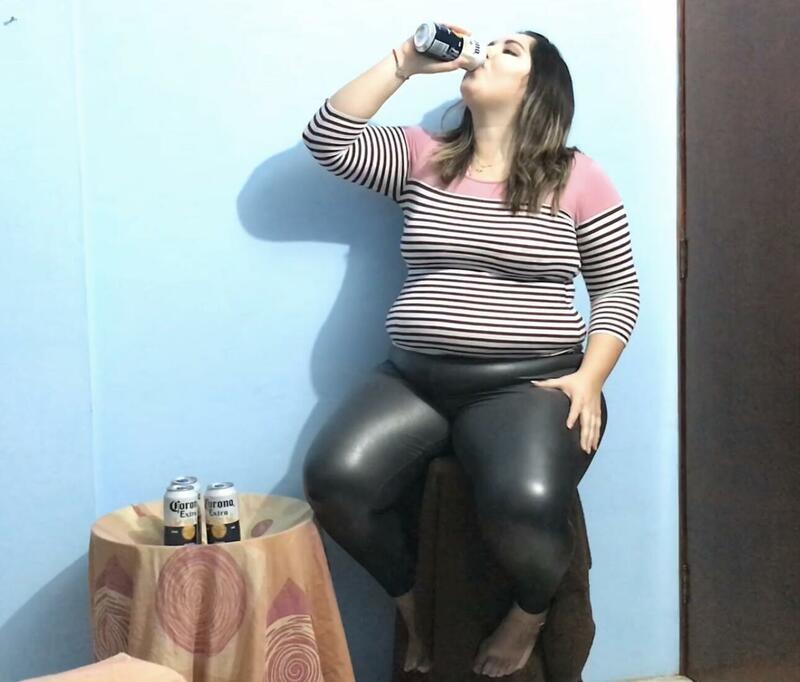 Laura’s body has been getting so big and one of the main ingredients to have that big belly are beers, but how can she being drinking beers with no hot burps ... without any dude you will be crazy for her huge belly and how is getting bigger at the same time she is finishing Almost two litres of beers. Does anyone miss my burps?? ?… or how big it looks my belly just with beers??? I love how your curvaceous figure really fills out that outfit your wearing. I especially love how those leggings really show off your gorgeous legs. that how every morning should be ! Laura has been enjoying her steady in her home country and her body knows that... tacos, beers, tamales, a bunch of buffets, a lot of reunions and her no self control it should be working to gain weight and some centimetres besides she’s been trying to mantain her numbers... A body tour by her new extra fat is gonna gave you an idea of how Laura’s body has been changing... actually you only need to watch how hard is for she to cross her legs when she is sit, after that the measures coming to turn you on and you are not going to believe how far she went in only 2 months + the revelation of her actual weight. We missed you A LOT. You are a GODDESS and you came back more beautiful than ever. Your curves are so much improved and your gorgeous face is even more gorgeous!!! I specially like your eyes and your lips.